Copyright 2017 - 2018 by James B. Van Bokkelen . This document may be duplicated and distributed for non-commercial purposes only, all other rights reserved. Corrections and criticisms to jbvbRemove_This@ttlc.net . 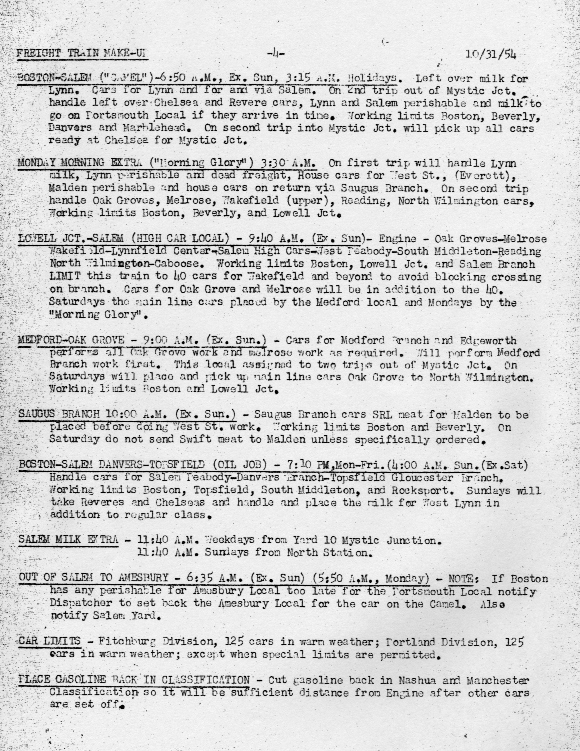 More general B&M information and a bibliography can be found on my Unofficial Boston & Maine RR Page . From the Hannauer administration (1926-9), the B&M organized its operations in detail. Its maximum main-line freight haul was about 300 miles from Rotterdam Jct. to Portland, and most hauls were 200 miles or less. The B&M was also a terminating road - it received mostly loaded cars entering New England from its western connections. In most years, the majority of cars coming in loaded were returned empty. The B&M also faced strong competition: the New York Central, via its ownership of the Boston & Albany offered single-road service to destinations across the Midwest and direct connections with Western railroads in Chicago and St. Louis. The New Haven also served the big Massachusetts cities where the B&M - NYC competition was strongest, and worked hard to get shippers to route via its Maybrook and Bay Ridge interchanges. Finally, the quality of New England highways improved rapidly from World War I onward, and its short distances favored truck competition even while over-the-road speeds were less than 40 MPH. But the B&M still had a lot of capital assets built for short-haul movements within New England, so running a tight ship was essential to profits. 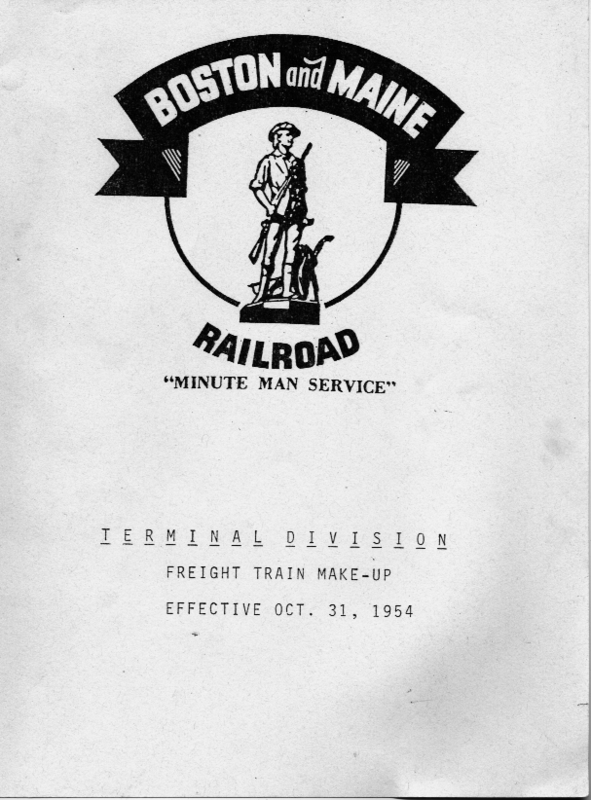 The post-B&M's operating goal was that every loaded car turned over to the railroad be either delivered to the customer or 'constructively placed' within 24 hours. This wasn't awfully difficult for points along the Fitchburg, Connecticut River and Western Divisions served directly from Mechanicvile yard: Sort the cars into blocks for the yard nearest the customer and ensure they connected to the proper local freight. 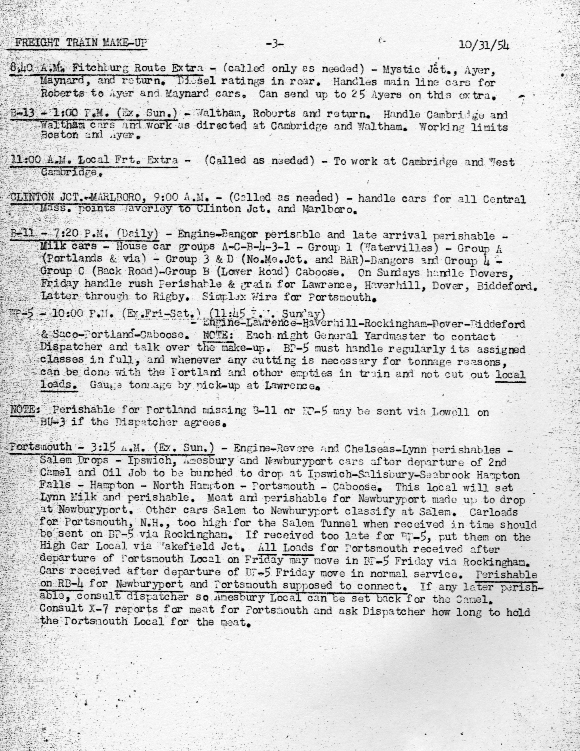 It was more complicated for destinations in Eastern Massachusetts and New Hampshire whose locals didn't originate in yards served directly from Mechanicville. B&M track and terminals of the post World War II era are shown on this system map from a 1964 Employee's Timetable. More information on specific B&M routes, including ETT track diagrams and details about many towns is given in my Notes by Location document. The B&M moved almost all of its freight as extra trains: Limited-stops through trains connected major yards. Secondary through freights would do on-line switching as necessary. 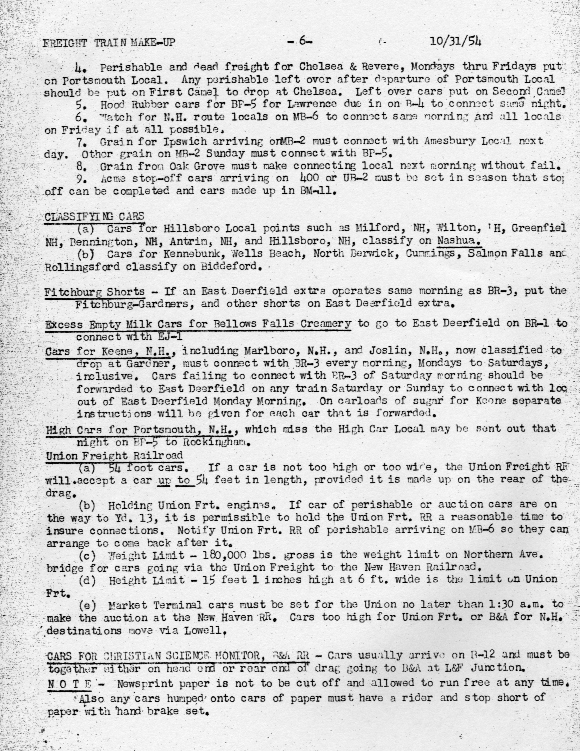 Most locals were made up in yards after early morning delivery of inbound cars, and returned to the yard with outbound traffic after a day'w work within 20-30 miles of their origin. Some lines had a daily local in each direction. These occasionally moved cars the whole length of the run, but were more often designed to avoid run-around moves that would interfere with passenger schedules. 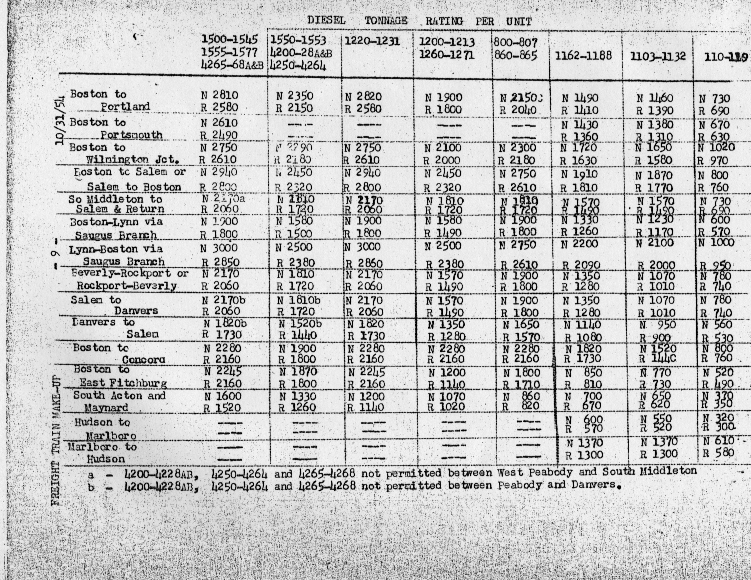 Until Hourly Car Hire went into effect on July 1, 1978, US railroads paid a per-diem (daily) sum for every foreign railroad freight car on their lines at midnight. 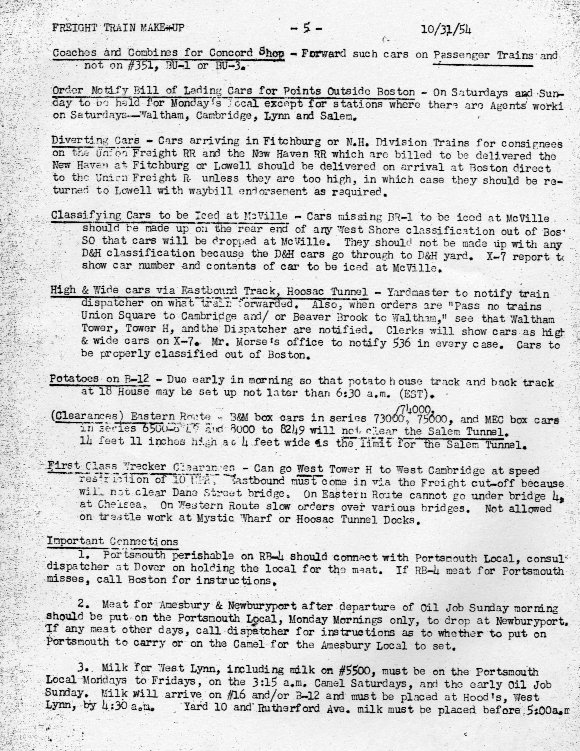 This was reflected in most roads' freight schedules; sometimes a train would be noted as "per diem", meaning it was a priority to get its cars sorted and delivered to connections before the (s)witching hour. On the B&M, this mostly applied to westbounds destined for the D&H interchange in Mechanicville, or the NYC via Rotterdam Jct. 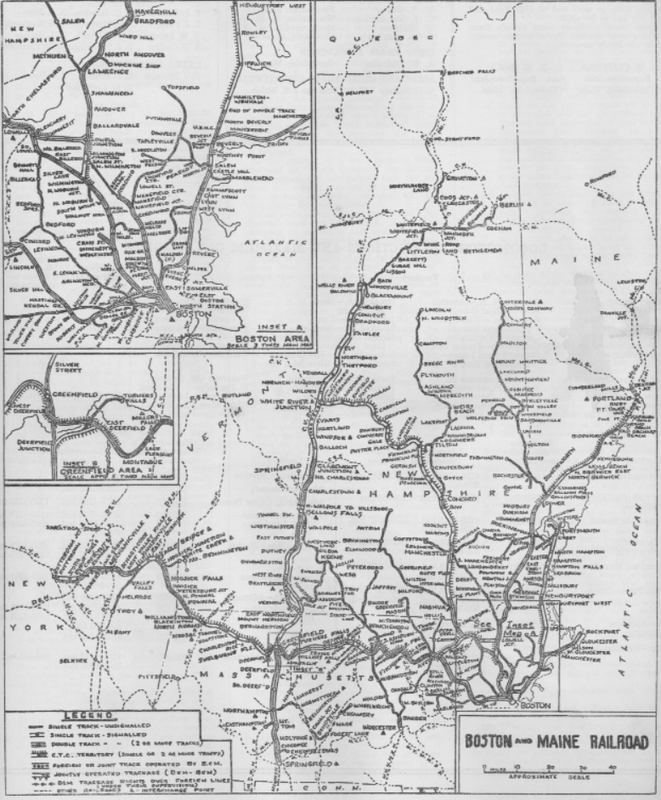 However, it's also visible in Connecticut River and New Hampshire Division schedules serving Springfield, MA, White River Junction, VT and Wells River, VT.
Until the last few years of the B&M, through freight trains had symbol names using letters to specify the terminals and a number to distinguish between multiple trains on the same route. Thus, BM-1 was the first Boston - Mechanicville, NY freight of the day, and BM-3 the second. 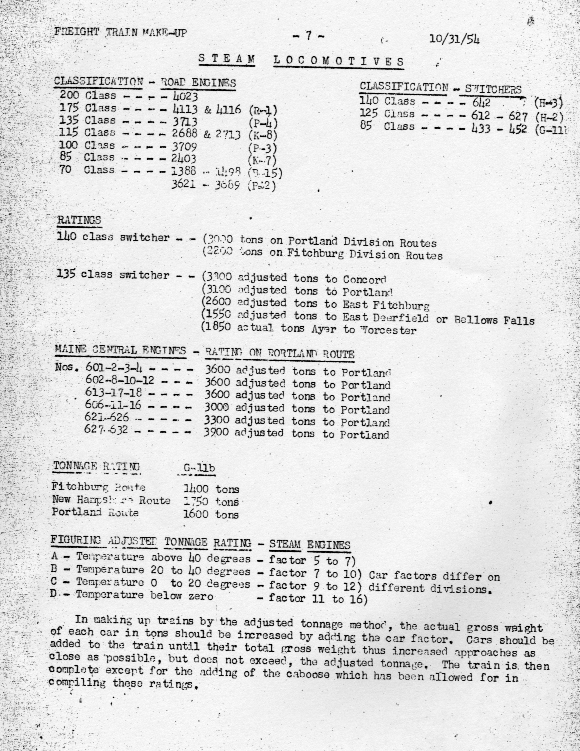 Local freights operated as turns (out-and-back from the home terminal) were designated by the terminal's letter and a number distinguishing this job from others originating at the same yard. 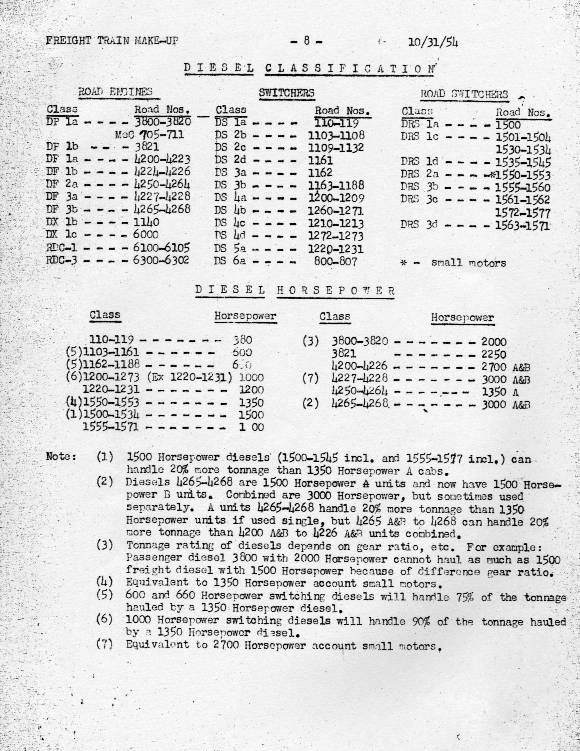 Thus, B-3 operated between Boston and Watertown, and B-7 between Boston and Waltham/Roberts. Letter to yard mappings varied over the years; each Freight Train Symbol Book defines its mappings. 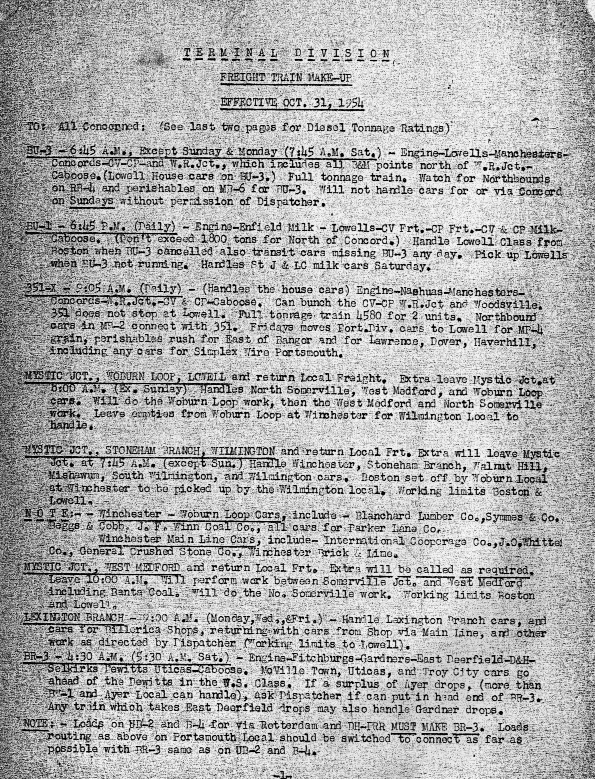 Earl Tuson has put scans of many FTSBs from #3 (1917) to #51 (1950) on-line. 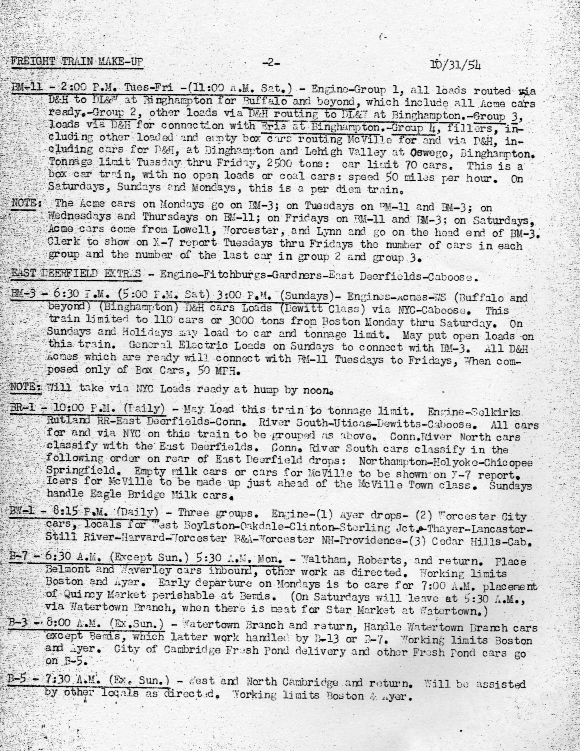 The B&M's 1954 operations and car movement goals in and around Boston are explained pretty well in this Freight Train Make Up document. Click on the page images to expand them. 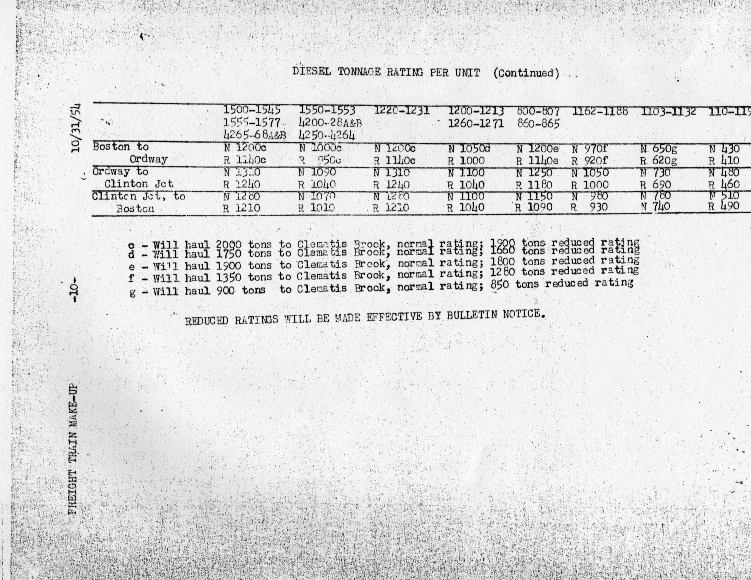 Page 10: Diesel Tonnage Ratings continued. Tonnage Ratings only cover limited routes. Employee's Timetables of the era have complete information. My copy is a reproduction from: .